Although the food industry is beginning to make headway with its sustainability initiatives, substantially more progress is needed in order to feed the world s growing population sustainably. The challenge is that the topic of sustainability can seem overwhelming and there is limited information that is specific to the food industry. Written by an experienced food industry professional with years … of experience in sustainability, The 10 Principles of Food Industry Sustainability inspires and informs the progress required to nourish the population, revitalize natural resources, enhance economic development, and close resource loops. The book makes this complex topic approachable and actionable by identifying the most pressing sustainability priorities across the entire food supply chain and showing, with tools and examples, how producers, processors, packers, distributors, marketers and retailers all play a role in advancing improvement. The book begins with an overview of the Principles of sustainability in the food industry: what they are and why they matter. 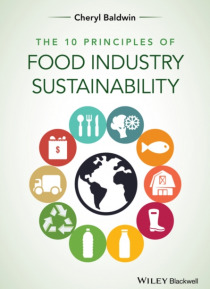 Subsequent chapters focus on each of the Ten Principles in detail: how they relate to the food industry, their global relevance (including their environmental, health, and social impacts), and the best practices to achieve the potential of meaningful and positive progress that the Principles offer. Specific examples from industry are presented in order to provide scalable solutions and bring the concepts to life, along with top resources for further exploration. The Principles, practices, and potential of sustainability in the food industry covered in this book are designed to be motivating and to offer a much-needed and clear way forward towards a sustainable food supply.